The FMS HS program has a multi-faceted, “Assess, Correct, Develop” system used to effect positive change for your workforce. All three facets of our strategy work synergistically to make an impact upon your workers as each facet contributes heavily to the others. Assessment results drive the Correction and Development strategies so we can offer your employees the information they actually need to be successful. Please continue reading below to learn how each piece of our approach works to benefit your workforce. 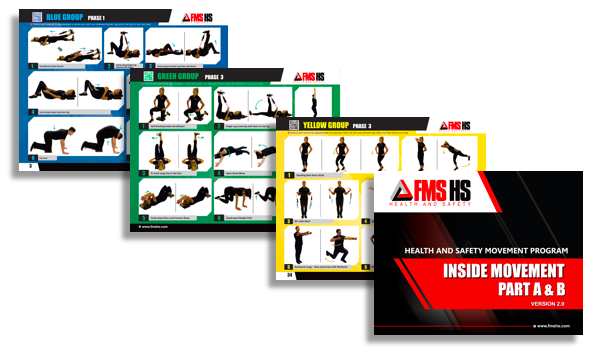 At FMS HS we use a proprietary, comprehensive screen to objectively evaluate both the health and movement ability of your workers. Our screen evaluates an individual’s ability to move through complex movement patterns, their capacity for mobility, and their capacity for stability across a variety of joint systems. The information provided by the screen offers us direction for the corrections detailed below as well as a predictive tool for identifying “at risk” personnel. Using the aggregate data points gathered from thousands of screens we can use the results of screens completed today to predict your employees’ risk of injury tomorrow. For more information regarding our assessment/screening process please click here to contact us. Using the data from our proprietary screening process we give each employee we work with a corrective exercise routine to complete. Rather than using a ‘one size fits all’ approach, the corrective exercises are based on the actual needs of the person expressed in the screening process. Beyond the corrective exercise program recommendations our staff are fully prepared to offer further individualized programming based upon the continuously developing needs of your workers. At FMS HS our primary purpose is to improve the quality of life of the people we work with. As such we are available for higher level exercise routines, injury rehabilitation programming created by on-staff physical therapists, nutrition recommendations from certified nutritionists, and advice on how to build and implement new habits in each person’s life. For more information on our individualized programing please contact us at info@fmshs.com. The corrective exercises are designed to be a morning warm up routine for workers. We provide exercise videos with the daily program. The videos are designed so different exercise programs and movement abilities are accounted for in the same video. This way a person with limited mobility can warm up next to a person with great mobility, appreciate the camaraderie of the situation, and both get exactly what they need. For individuals who want more privacy, or companies for whom a group warm up is not feasible, we provide an online platform that can be accessed via any internet provider or an app on both Android and Apple operating systems. For more information on our daily program please contact us at info@fmshs.com. If compliance is a challenge you have faced in previous programs - we have a solution for you. The education we provide to your workers is not limited to facts about the human body. It also expands into implementing new habits, and creating a workforce who actually practices the education we provide. Furthermore, we offer Quality Control (QC) visits as part of our service to your workforce. 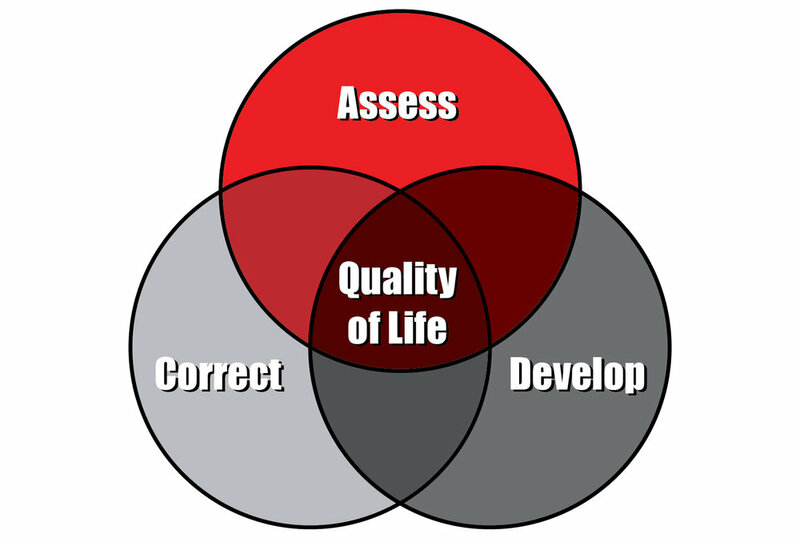 The purpose of a QC visit is to, first and foremost, be a resource for each person in the program. It is an opportunity for questions to be answered and for learning to continue. It is also an opportunity to make sure the program is being followed appropriately. Workers can use the online platform to access their exercises and other personalized recommendations from anywhere they have internet access. Our online services store all of the employee’s screen results and show how they have progressed (or regressed) overtime. Our online system also has built in exercise fitness routines that match with each person’s individual movement capabilities and needs. We do not provide “one size fits all” programs as no two people are exactly alike. For more information on our online platform please contact us at info@fmshs.com. At FMS HS we believe the key to lasting improvements lies in education. We teach each person we work with how to best take care of themselves in three primary categories of health: movement, nutrition, and recovery. Using the philosophies of movement developed by Gray Cook, Lee Burton, and the FMS HS team of doctors, physical therapists and athletic trainers, we teach your workforce the basics of human movement. Developing a clear understanding of human movement empowers each individual employee with the tools they need to reduce chances of injury, and to move with resiliency and durability at work, home, and play. Furthermore, providing your workforce the “why” behind what they are being asked to do every day enhances compliance by providing the intrinsic motivation necessary to practice our program day in and day out. Why You Need It . . . Managing nutrition is a cornerstone of managing bodily stress, promoting recovery, and preventing both injury and fatigue. We teach our workers the information they need to make the best decisions for themselves including: how to choose a balance of healthy foods, what the current research says regarding different “fad diets,” how to build healthy nutritional habits, and how to use nutrition to mitigate inflammation. Data indicates proper recovery is directly related to a reduction in risk of injury, an increase in worker effectiveness, and a reduction in chronic, preventable illness. We teach your workers that recovery is an accumulation of proper corrective exercise (movement), nutrition, and sleep practices. For more information on how your company will benefit from our program click here. Using an understanding of your natural sleep cycles can help enhance your recovery each night, and help you wake up more refreshed each day.